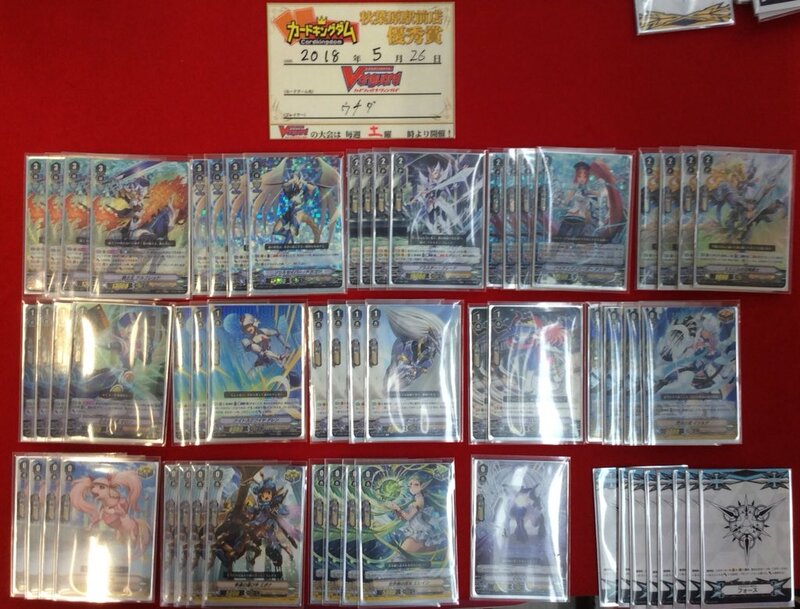 Yesterday at Card Kingdom's Akiba branch in Chiyoda, Tokyo, Royal Paladin cardfighter Uchida made first out of 37 participants with a Soul Saver-King of Knights deck. Card Kingdom is one of the bigger card shop chains in Japan, thought to be one of the inspirations for Card Capital in the Vanguard anime series. Compared with Guld's third-place deck from the 1st TraCaider VGCS, Uchida's deck is almost identical save for his choice to run Wingal over Lion Mane Stallion. Although Lion Mane and Wingal can both make 23k columns--with Akane for Lion Mane and Blaster Blade for Wingal--the additional 5k from King of Knights' superior call means Blaster Blade can actually reach 28k, a more important guard threshold in Standard for how it forces the opponent to use a Heal Trigger or two guardians.